Discover Atlanta by reading the smart tips and local advices about restaurants, things to see, accommodation and shopping spots. As one of the most popular southern cities in the U.S, Atlanta has many different things to offer visiting business and academic travelers. Considered to be the vanguard of the new south, Atlanta has a certain ambiance and charm surrounding it that combines the old southern cultures with the modern ones. With more than 5 millions residents, the city has quickly become one of the number one places to live in the U.S. Surrounded by thousands of peach trees, all Atlanta visitors will quickly realize where the nickname, “Georgia Peach”, came from. Showcasing the busiest airport in the world, this beautiful southern city was the host to the 1996 summer Olympics and is known as the leading figure in the Civil Rights movement. With many different city districts, the entertainment options are virtually endless for all business and academic visitors. Depending on which part of the city you’re visiting, whether it’s Midtown, Downtown, East Atlanta, Buckhead, South Atlanta, Decatur or West Atlanta, there are a wide array of different activities and eating options to enjoy. For anyone that is visiting Atlanta, it’s extremely important to know that the city is relatively large as it covers close to 8,700 square miles with its metro area spanning across 28 different counties. Surrounded by water on the northwestern side and offering many unique adventures, the city’s main source of water is the Chattahoochee River. While the majority of Atlanta residents depend on their vehicles for daily transportation, public transport and walking are both viable options for all city visitors. This is especially true if your travels restrict you to the downtown areas of Atlanta. Because the downtown area is relatively condensed and has had many improvements made over the past several years, all of the districts within the city can be easily accessed on foot. If you plan on visiting the different city districts, walking becomes more difficult. For anyone that is visiting Atlanta on a business or academic trip and needs to travel between different districts, public transportation is the best option. The Metropolitan Atlanta Rapid Transit Authority (MARTA) is the main form of public transportation within the city. Offering both railway and bus options, the MARTA can bring you to just about any destination in the city. Because of its year round warm climate, there are a wide range of different attractions that Atlanta has to offer. One of the best things to do during your visit is touring one of the many local museums and historical locations. Whether it’s the CNN Center, World of Coca-Cola, Georgia Aquarium, Martin Luther King Jr. National Historic Site, Atlanta History Center. Fernbank Museum of Natural History, Michael C. Carlos Museum or the Jimmy Carter Library and Museum, visitors can see a wide variety of different types of national and state history. Another great Atlanta entertainment option is its many different parks. Combining a unique history and park experience, many city visitors often tour the Centennial Olympic Park. Located in downtown Atlanta, you will be able to see the famous location of the 1996 summer Olympics. Still showcasing the Olympic rings and situated on a man-made river, you can ice skate here in the winter or enjoy a concert in the summertime. One of the best places to shop in the entire city is Underground Atlanta. Offering a large assortment of unique shops and boutiques, this location is definitely a can’t miss shopping destination. Providing goods that range from electronics to hand made knickknacks and paintings, some of the best merchandise in the city can be found here. Widely known for the amount of celebrity chefs that have recently opened restaurants in the area, Atlanta has many different eating options throughout all of its districts. For one of the best dining options in the city, the Spice Market offers some truly genuine Asian-infused cuisine. Owned and operated by world renowned chef Jean-Georges, the Spice Market is open for breakfast, lunch and dinner. If you’re in the mood for some truly authentic southern food, there are many different options available. One of the most popular southern style restaurants in Atlanta is Bacchanalia. Rated as the top restaurant in the city for seven years running and boasting the “Best Chef in the Southeast, this restaurant only uses small-farm, organic products. Another one of Atlanta’s great eating experiences can be taken in at the Canoe. Located along the Chattahoochee River, this restaurant has been featured in famous food publications like Food and Wine, Bon Appétit, the New York Times and Gourmet. With reasonable prices and authentic southern cuisine, you simply cannot go wrong by eating at the Canoe. For anyone visiting Atlanta on a business or education trip, you absolutely cannot miss the ATL – Cruzer Electric Car Tour. This excursion will offer a brand new way to explore the city and take in some historic destinations that might otherwise be missed. The Cruzer Tour will bring you by some of the best places to eat in the city and some of the best sightseeing destinations. Another great experience while visiting the city is the Atlanta Specialty Tour. Just like the tour name says, these excursions specialize in showing you the unique history throughout Atlanta. In addition, the tour offers the option of utilizing a bilingual tour guide if necessary. 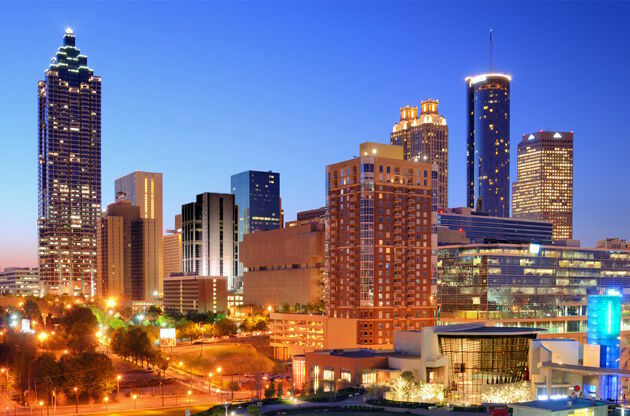 If you are visiting Atlanta for a business trip, there are also many different events for you to experience. Each year, numerous academic or business events like conferences, congresses, symposiums, fairs, trade shows and exhibitions are held here and draw global attention.